Every few years, a great culinary idea comes along that revolutionizes fast food. Over the past 50 years we’ve seen burger chains, pizza chains, burrito chains, sandwich chains and even coffee chains. The basic premise is the same: “Here’s our basic product, now you tell us what you want on it or in it and we’ll complete the preparation just for you!”. And, it works. In my vegetarian days I used to love experimenting with different pizza toppings, and still now, a visit to a Subway fills me with excitement as I get to decide every time what kind of vegetables I want on my Veggie Delite(tm). Now, the vegetarian and (more to the point) vegan world has no specialist fast food concepts that are aimed directly at us. Of course, we can get ‘something’ at most chain establishments but food preparation practices and very limited choice typically leave us with the least appetizing thing on the menu. At a Maoz you get handed a warm, soft pita bread with a few perfectly cooked and very tasty falafel balls deep inside, and your choice of several integrated condiments (I like Humous, but there are two other vegan options), then (get THIS!) they let you loose on an amazing cold salad bar that’s NOTHING like you’ve ever seen before. 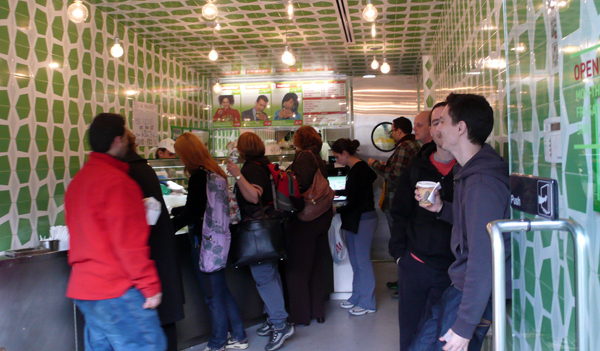 Here’s my Maoz, after salad bar application, outside the Union Square outlet this past weekend. I’ve visited two outlets: Union Square (twice!) and London once. Both were highly consistent and tasted almost exactly the same. That’s a good sign for fast food, as the founder of McDonald’s, Sam McDonald (or whatever his name was) had an obsession about the customer experience being the same globally. Now, talking of customer experience, you’re in and out of the place pretty quick. Even on crazily busy Union Square Market Day. But, even with such a limited selection, the Anthropic One had one heck of a sandwich to enjoy. I hope beyond hope that Maoz takes off in the US. They seem to be opening more outlets (Washington DC and somewhere on the West Coast [Seattle or Vancouver – difficult to tell from the map] are about to open, and they have a franchise application on the US site, which (if we were not in a historic credit crunch) would be a great indicator of more restaurants in the US to come. Regardless, I’ll be in London in a few weeks and will report back on Maoz, along with a storyboard of ordering and dressing the perfect sandwich. 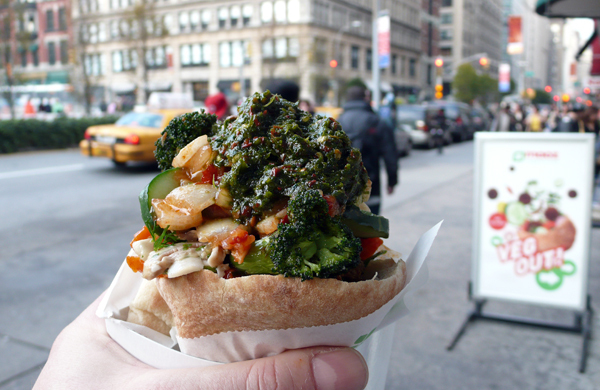 If you ever walk past, please stop in for a Maoz. All this deliciousness was only $9.90 + TAX. Can’t think of a better deal for fast, healthy nutritious food in Manhattan — or elsewhere! 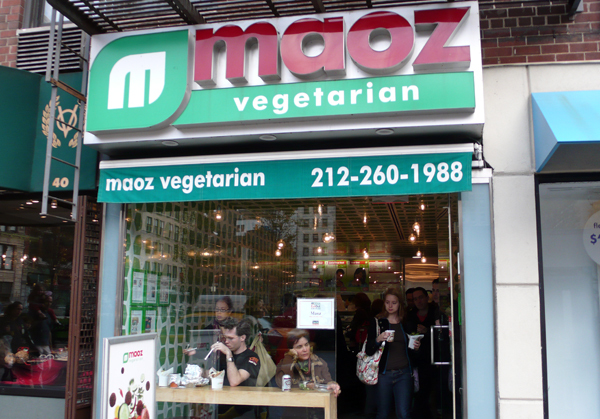 I remember seeing the Maoz storefront in Union Square when I was there over Labor Day weekend 2007, but opted to dine at the (now-defunct) Zen Palate instead. I’ll have to give it a shot next time; it looks like a fun dining experience! look at that giant tower of a sandwich! if that place were in LA I think I’d be there every day! Looks yummy! If you are ever in Santa Barbara, CA – try Sojourner Cafe, really tasty food, mostly vegetarian with many vegan options. MAOZ IS AMAZING. It kept me alive in Europe. Cheap. Amazing. The salad bar still haunts my dreams. I called them a year ago and begged them to open an LA location. 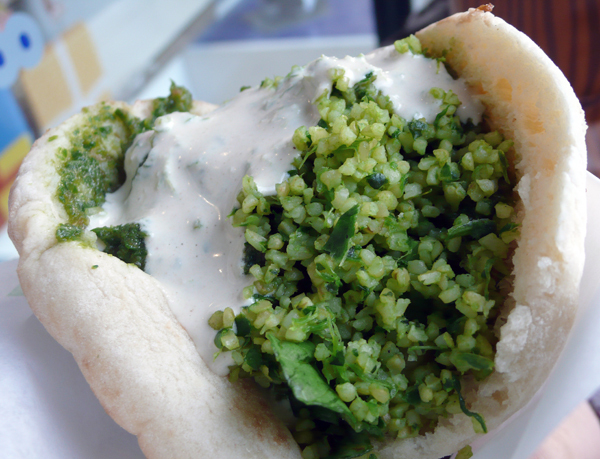 Have you been to Bella Pita in Westwood? Same general idea, though not as huge a bar of condiments. They have another vegan filling besides falafel, based on black beans. I enjoy reading the well written articles. I totally enjoyed every little bit of it. I have you book-marked your blog in order to check out the latest information in the future.